Breathtaking beach views! Top floor luxury at Island Princess 705! Have you ever closed your eyes and dreamed that you could feel the sand under your feet, the sunshine on your face and hear the sound of the waves coming ashore? that dream is now within your reach Come enjoy our white sandy beaches and our emerald green waters. In the heart of Okaloosa Island sits the crown jewel, Island Princess. This luxurious gulf front condo complex offers you spectacular beach views and comfort, without spending a king’s ransom. Enjoy your days by working out in the gym, cooling off in the gulf front pool, wash your cares away in the hot tub or use the outdoor BBQ area to prepare a delightful meal. This Newer 7th Floor Penthouse unit that was just remodeled to include granite throughout, new cabinets, new paint, new flat screen televisions and new bedding, features two bedrooms/two bathrooms and has absolutely everything you need to make your next family vacation the best ever and it’s situated directly on the sparkling emerald waters and the sugary white beaches of Okaloosa Island. You get full unobstructed views the from living room, dining area, kitchen and master bedroom suite. You will also enjoy an oversized gulf front balcony to stretch out on and catch some rays or watch the dolphins go by each morning as you enjoy your morning coffee. Additionally with this penthouse unit, there are no neighbors above you to contend with, so sit back and enjoy the peace and quiet. The lovely master suite has a king size bed with a large flat screen television with built in DVD player and sliding doors to access the balcony. The large master bathroom features a tub/shower combo and a beautiful vanity with a granite counter top. The second bedroom at the front of the unit, features a comfortable queen size bed, a flat screen television with a built in DVD player and access to the second bathroom. The spacious living room offers plenty of seating for everyone, a comfortable queen size sleeper sofa for additional guests and large flat screen television and DVD player for everyone’s viewing enjoyment. The spacious and newly remodeled kitchen has all the comforts of home and then some. It is fully equipped to fix a wonderful dinner or a simple snack with a large bar that offers seating for 3 guests and a dining area with seating for an additional 4 people. There is a separate laundry room in your unit with a stack able washer and dryer. A private covered parking spot is provided and Free High Speed Internet Access is included as well! 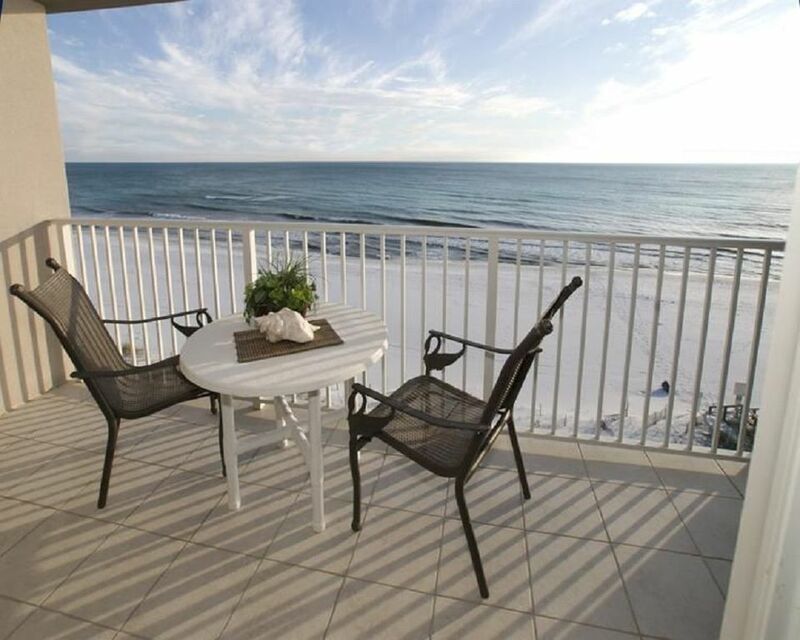 There are large boardwalks for easy beach access and the complex offers easy access to the Emerald Coast Convention Center, the Boardwalk and Fishing Pier or take the free Island Shuttle to the antique shops in Fort Walton or the famous Destin stores. Island Princess is close to many excellent restaurants via a short walk or short drive, local attractions such as theme parks, mini golf and go-carts. The shopping is beyond belief with the USA s largest designer outlet mall only fifteen minutes away with other major shopping areas even closer. Hi, Shelly! It was a pleasure having you as at guest at Island Princess 705. Thank you for taking the time to leave a review. I'm looking forward to your next visit. We stayed for a week and enjoyed a much needed Girls Trip. Both bedrooms was very nice and everything we needed for the most part was there. We brought our own beach towels and with washing machine in penthouse never ran short of towels like others had posted. It was so nice to see Sunrise and Sunset every morning from our balcony. Kitchen was completely stocked with dishes and utensils that we needed to cook and make some evening drinks. If you stop right before trip for groceries and bring the extras that are stated in email you will be set for entire week!!!! I will be staying in this Penthouse again! This was our first family vacation. And it was amazing! The view from the living rm/balcony and master bedroom was breathtaking! We will definitely be back to this condo again! It’s close to everything and very family friendly. Can’t say enough LOVE LOVE LOVE. The Condo was in good condition. The beach and views were beautiful. Gave 4 stars because issue with code to get into condo and air conditioning not working. We were not able to reach David by phone text when we arrived. This was stressful and delayed our agreed on entry time. We walked down to the pool area where there was a worker for another vacation service. She was extremely friendly and helpful. She was able to reach the owner who gave her a different code so we could access our rental. David was easily reached for the air conditioning issue and it was fixed right away. we had a great stay. Condo was very clean. This was our first visit to. Ft. Walton Beach. We enjoyed our week stay. The condo met our expectations. Very clean, very quite. Loved our balcony view of the ocean. Watched dolphins every morning while we ate breakfast on the balcony. Only down side was not enough towels and wash cloths for our stay. We had to go buy more for our stay. Other than that we had a great time. And we will plan on renting this condo again. We had a wonderful stay at this lovely condo right on the beach. The condo itself was clean, comfortable, and updated. The kitchen area was especially nice. I loved being able to see the ocean and sky from the kitchen, living area, and master bedroom. The view from the balcony was fabulous. The pool and hot tub were clean and well-maintained. We enjoyed meeting other families staying there. The beach was gorgeous, clean, and walkable to the Okaloosa Pier. Parking was plentiful and easy. I would absolutely stay here again.